This project and pattern are going to be presented in a bit different and less structured manner than other tutorials that I have created and posted for you in the past. This is for a couple of different reasons, the main one being that as of right now, it would be near impossible for this candle holder to be made the exact same by everyone who will create it. It will call for the use of a square form and not everyone will be able to use the same one that I used. The finished size also will impact the amount of paper that is used. Everyone will likely use different amounts. Hopefully in the future I will develop a solution to this problem, but for now, you will just need to bear with me and get a little creative. This project is really fun, so I hope you will give it a try. As in most of my patterns, this one also calls for the use of forms in various sizes. 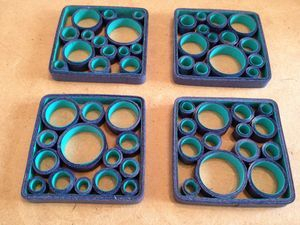 Although it will not provide all diameters needed, a stacked quilling form may be used to create a variety of rings. You will also need a basic understanding of quilling which can be learned from our Basic Quilling Shapes Tutorial. This design calls for two colors of 1/4" quilling paper - A) inside color & B) outside color. There are no exact amounts of paper called for in this tutorial. It will completely depend on the size of the square form that you choose and the overall size of your candle holder. My finished projects were 2 x 2" squares. I used 50 strips of 24" paper in each color. You may use a bit more or less. Square form This can be any size of your choosing. The larger the size, the larger the holder. 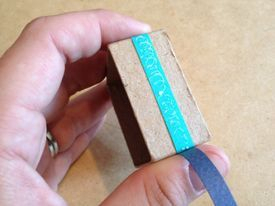 I chose to use the inside portion of a small gift box that measures 2 x 2". Various round forms You can use any variety of diameters that you can find around your house. Try to find at least four or five different sizes. I love to use knitting needles, but pens, markers, etc. work well too. You will begin making your first panel with a partial strip of color A. Wrap the strip around your square form as snugly as you are able. Secure to glue after only one pass around as shown in the picture below. Cut off any excess paper and glue down any extra bits. Seamlessly join a strip of color B. The most important factor from here on out is to take your time and be precise. The paper needs to match up perfectly. This is not a quick project, so do not try and rush it. You will be much happier with the finished quilled piece if you are meticulous. Once the strip is secure, you will continue to add glue along the entire underneath strip. Use as little as possible while ensuring that coverage is full and complete. Lay the B strip directly down upon the glue and gently press to secure. This is the process you will follow on each side for the remainder of making each panel. Stretch the paper as you go along to make sure it lays smoothly. Be sure to get glue on the corners so nothing buckles. Your biggest challenge will be finding the appropriate amount of glue to use. You do not want it using out the sides, but you also need to have enough so that all surfaces are covered. Continue on using color B strips until your panel is about 1/8" wide. Keep track of exactly how many strips you have used so you can be sure all of your panels will be an exact match. On my 2 x 2" form, I used 4 24" strips in addition to the little bit of color A. When your panel is complete, gently slide it from the form and allow to dry. Make three more in the exact same manner (4 total). Make one more square panel using only color B as shown below. Using your various round forms, create closed coil rings in much the same manner as the panels. Use color A just once around each form before joining color B. There is no need to glue each layer however. How many rings you make and in what size will be entirely up to you and your artistic eye. My method for determining how many to make was to start with the creation of the larger rings and placing them in each of my panels un glued. I proceeded to the smaller rings and kept tweaking the arrangements of each panel until I liked the way they looked. Once arranged to my liking, I glued each ring into place. I arranged all four prior to gluing. Allow to dry completely before proceeding. Place a thick strip of glue along one edge of one of your four panels. Carefully line up the glued edgle with another panel's edge as shown below. Allow to dry before adding the third panel. Put a strip of glue on both inside edges of the last panel and line up to the other three. Allow to dry. Once all sides have dried and the structure is secure enough to pick up, place a thick line of glue down each of the four outside seams. Allow to dry completely. Cut four straight strips out of the solid B panel that you previously made. You will basically be removing the rounded corners. You want the strips to be 1/4" shorter in length than your panels. My strips were 1.75" each. Place a dot of glue on one side of a strip and attach a small strip of color B.
Click here to edit text. Wrap the strip of paper around the edge and secure with glue to the entire front side. Continue back around to the back side and glue to secure. Make 8 small closed coils. I used 1.5" strips to create mine, however if you made a larger holder, you may wish to make these coils larger to match. Glue a small coil to either end of each strip as shown. Allow to dry. 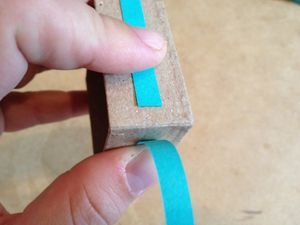 Place a strip of glue along both edges of the piece you just created on it's back side. Place along the outside corner seams of your holder. Hold in place to secure. 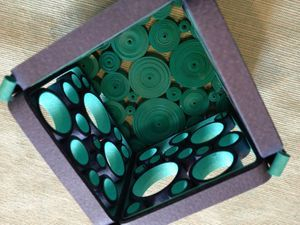 The fun and funky base of this holder is created by making and placing various sized closed coils in a random pattern on the bottom of the holder. I quilled a bunch of coils using 1" - 168" strips. Glue each coil one by one and allow to dry. Do not allow any coil to 'hang' over the side. A view from above shows how interesting the effect is. Once your base has been created, you will want to allow all parts to dry completely before moving on to finishing. This holder was created with intention of using it in conjunction with candles. Fire and paper do not normally mix and if you choose to use your holder in this manner, you will want to make it fire retardant. You have two options to choose from and I will cover them both in this tutorial. You can paint on a coat or two of a product called Flame Control that will seal and protect your work as well as help your house not burn down. The sealer comes in a variety of finishes. If you choose this option, be sure to seal your work in a highly ventilated area and consider wearing a mask. Since I currently live on an island that will not allow me to ship Flame Control, I was moved to find another option. With a few ingredients that can be found in a grocery store, you can soak your finished work in a solution that will make it flame resistant. I will work on making a tutorial for how to do this specifically with quilling projects, but for the time being, follow this link to view an instructible on all of the how to's. Be reminded that you can always opt for the flame free, LED version. No open flame = no concern whatsoever. Thank you & Happy Rolling! I hope you enjoy creating your very own version of this design and many of the others I have created and put here for your personal use on the Little Circles website. If you have the time and think it worth it, I always appreciate the likes, shares & pins that allow our community to become a bigger and better place. If you have any ideas or suggestions on how to make this tutorial better or need clarification, please feel free to contact me. Would you like to recreate & sell this design?